I went to my 1st ever MG shoot/BBQ/Karaoke party yesterday. Man what a time, no big oddball MG's there. Were two 1919 beltfeds, many AK variants, couple of HK's, couple of Uzi's , a few Mac 10/11's, a silenced M3 Greasegun, a Sterling, a Mk2 Sten, a Reising, a Swedish K, and a Madsden M50. Only one other than myself had a Thompson there, an older gentleman with a nice green parked Bridgeport M1. He also had a C&R MP40 but it was put up when I got there. I took my WH 28 and it was pretty well looked over.. it fired flawlessly except when I loaded the drum incorrectly. I got to see fondle and shoot all my tranfers. The Wilson MP40 was awesome.. fired everytime with every mag and was requested by two of the other shooters to play with, the WH M1 is in excellent near new condition, I had a problem with it taking GI mags but there was a guy there with AO mags and two out of three of them worked great. The Sterling was fun to shoot had no trouble with it using any of the DSA mags I just got in. The only problems I had were with the Reising. It was a jammamatic. didn't like any ammo I used but I only tried out one mag and the gun felt like it needed cleaning and possibly a new set of Wolff Springs. The other Reising had a problem too. Was a great time and nobody got drunk or got hurt, range rules were followed and everyone had a good time...there were some dang fine lookin' ladies there too.. and the kids loved shooting the beltfeds and the Uzi's I can't wait til my next one..
That sure sounds like a blast, no pun intendeed. Post the pix, we would love to see them. Send me a couple favs and I could post them on my web site. Oh yeah...I was the guy with the 1927 that was asking you about your case. Glad you had a good time and I hope it is the first shoot of many to come! I have never really been to a shoot that wasn't fun, nor do I know anyone else who has. I suppose the noise gets to some, but not me!!! Maybe see you sometime in the spring at Knob Creek (or, if you haven't yet joined the TCA, maybe now is the time and I'll see you at their next shoot!!! Yeah hi Scoobie...here's a contact for a case..that was a great afternoon...I am still sore from loading mags. He's also a board member, "1921A"
Yeah .. I'll probably join the TCA.. I sure hope you took some video. I bet it will be one home moive you actually watch more than once. Jim, You don't know how many times I've watched Band of Brothers.. But no.. Someguys did get some video.. I was busy shooting.. but I did get some shots on my digital. 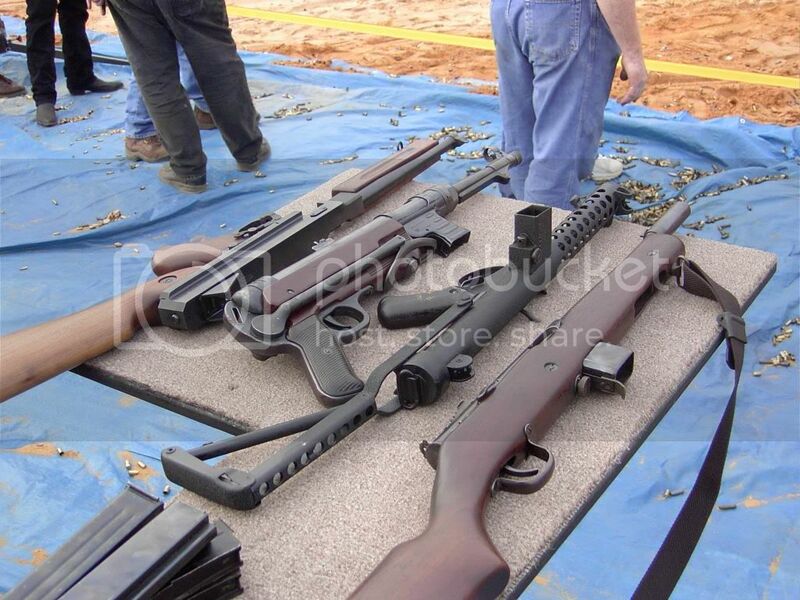 The first and last pics are of the guns I have in transfer.